Ak-Chin Pavilion is an outdoor amphitheater. 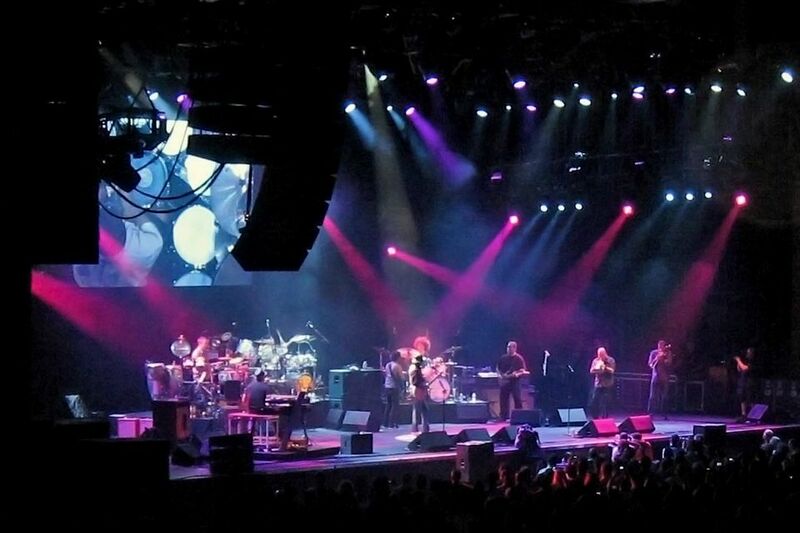 The venue first opened in November 1990 with a concert by Billy Joel. It used to be called Blockbuster Desert Sky Pavilion, and then it was Cricket Pavilion, then Cricket Wireless Pavilion, then Ashley Furniture Homestore Pavilion and then back to Desert Sky Pavilion. Hey, let's pick a name and stick with it! It was renamed Desert Sky Pavilion for the second time in 2012, and then Ak-Chin Pavilion in 2013. Ak-Chin Pavilion has about 8,000 reserved seats under a Pavilion roof. About 12,000 more people can enjoy the concerts and shows on the hillside grass. Large video screens assist them with the view. Concerts are held here year-round. In the summer, overhead fans help to keep the venue bearable for evening temperatures that don't really cool down all that much! Check the monthly concert calendars to see who's coming to Phoenix to perform at Ak-Chin Pavilion. See a Seating Chart for Ak-Chin Pavilion Concerts. I have attended various shows at this venue over the years. Here are some tips for you about attending a concert here. When driving to the Ak-Chin Pavilion, you'll be closest to your seats in section 201 or 202 if you arrive from the east. That would mean that you would exit I-10 at 75th Avenue instead of 83rd Avenue.Sections 204 and 205 are on the west side, so 83rd Avenue would be close. Section 203 is in the middle. That's a toss-up. Will call is located at the 83rd Avenue (west) entrance, so if you have to stop there first, exiting at 83rd Avenue might be your best bet. There is no charge for parking for most of the shows here. VIP parking passes are available to purchase. There are no play areas for children here, and the crowds are such that you might not want toddlers running around on the grass, not to mention that it might not be pleasant for the people around you. My opinion? Bring children who are old enough to sit through the show. For general admission grass seating, you may bring a blanket or low chairs. Any chair where the seat is higher than nine inches will not be allowed, and you'll have to leave it at Guest Services before entering. People will start to arrive about an hour or more before show time to grab their preferred grassy area. Keep in mind that for many concerts everyone will be standing or jumping up and down or dancing for the entire show. It's a party on the grass! Desert Sky Pavilion is an open-air amphitheater. Most people in the 100 and 200 sections are under a roof that has some fans circulating air. There are no refunds for inclement weather. Small umbrellas are allowed. The concourses have misting systems where people can cool off when it's hot. You may bring in one sealed bottle of water per person. No other beverages or food are allowed. In sections 201 and 205, in the extreme corners, you will have a view of the entire stage. These are also areas where there is no roof cover, so on hot evenings there are no fans circulating air there. If you are concerned about people walking in front of you during a concert, I wouldn't sit in the 300 sections. While they are reserved seats, there is a concourse in front of them where everyone walks to get another beer or take a trip to the restroom. Speaking of restrooms, there are plenty! While the official website indicates that smoking is not allowed anywhere in the seating or lawn areas, there were people smoking in the seating areas. Generally, you may bring a personal camera that takes still photos. The website indicates that no flash photography is permitted. Of course, on the evening I attended, flashes were going off for the entire show. I thought the concession prices were very high -- higher than at our professional sports venues or other concert venues. Of course, the tickets aren't usually as expensive, and parking was free, so that offset the price of food and beverage a bit. From I-10, exit at 75th or 83rd Avenue. From the HOV lane, you can exit at 79th Avenue. Turn north (right, if you were going west, left if you were going east). The Ak-Chin Pavilion is about 1/2 mile north of I-10 between 79th and 83rd Avenues. Ak-Chin Pavilion is NOT accessible by Valley Metro Rail.